Need a healthy breakfast on the run? Maybe these innovative new Muesli Pods might be just what you need. Research suggests that around 50% of Aussies skip breakfast because they're just too busy. I know I often "forget" to eat in the mornings because I'm too damn busy trying to fit in exercise, making lunches, helping with homework and getting ready for my everybody's day. I find it particularly difficult to eat a healthy breakfast when I'm travelling. Take this week for example. Unless I go to the effort of taking my own cereal and buying milk on arrival (that I end up pouring down the sink before we leave) I end up with nothing other than an apple or the temptation to eat the very expensive and very big all-you-can-eat buffet. So I was excited to hear about these Food for Health Muesli Pods and was even more excited when the PR company sent me some to take to Sydney with me this week. My travelling breakfast woes are sorted! 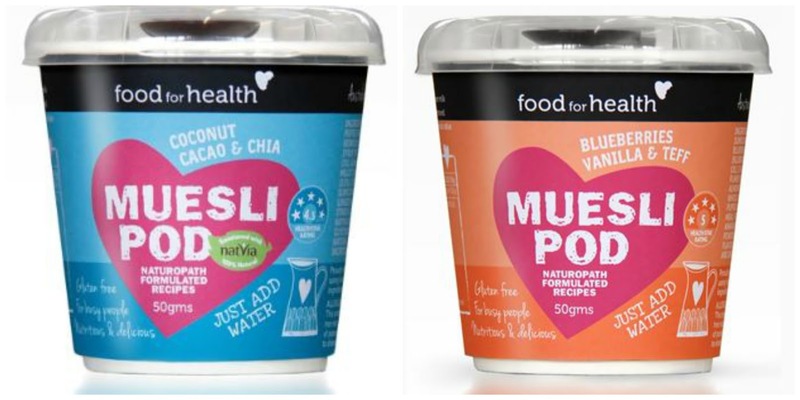 Food for Health is one of Australia's leading muesli brands and they've come up with a brand new "grab and go" Muesli Pod full of nutrient-packed super foods. Each little pod contains a bunch of healthy muesli style ingredients along with a shot of milk powder and an iddy biddy spoon. All you've got to do is add water and "voila" you've got a nifty little breakfast that fits in your handbag. The pods are gluten free, low in fructose, have no added cane sugar and have a health star rating of 4.5. The Coconut Cacao and Chia pods are packed with buzz word ingredients like chia seeds, coconut, cacao, psylium and are naturally sweetened with Natvia. I also tried the Blueberries, Vanilla and Teff pod that provides protein, antioxidants, omega 3 fatty acids, magnesium and iron. A great combination to kick start the day. They're long life and don't require refrigeration which means I can leave them in my luggage, in the car or in my handbag. You can boost their taste and appeal by adding cut up fruit like blueberries and strawberries to give that fresh factor. They're created by a fellow Aussie mum and entrepreneur and they are made with love. I found them a little bit small for my liking. I would normally eat twice as much cereal for breakfast. Maybe that's why I'm carrying extra weight right now? While milk powder really is just dehydrated milk, I did miss that true milky taste even after I added the water. These wonderfully healthy ingredients can be a little bland for some taste buds but once I added fresh fruit I thoroughly enjoyed them. 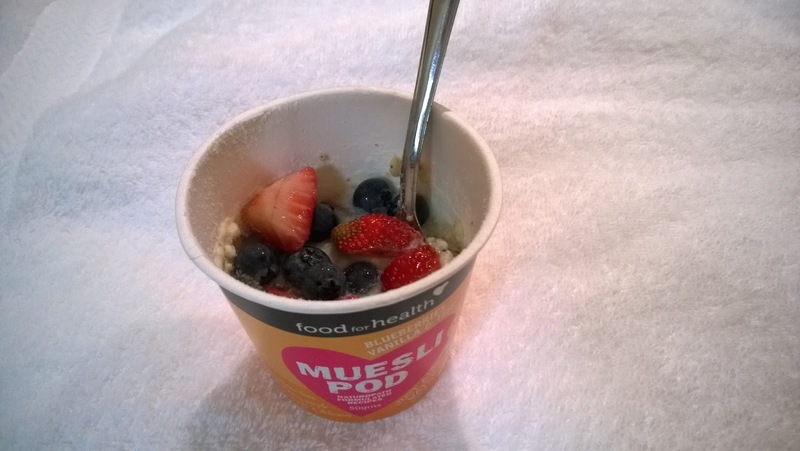 The Food for Health Muesli Pods can be found in Coles, Independent Supermarkets and online stores. Well done Food for Health. Well done!